You can now purchase Bubba’s gift cards online. With this option, you can send a gift instantly in any amount you choose. 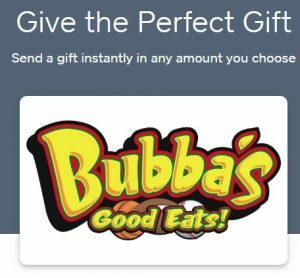 Click the image below to send the perfect gift – Bubba’s Good Eats- Home of the world’s greatest recipe…Good food, family & friends!